Are you ready to practice your short game? 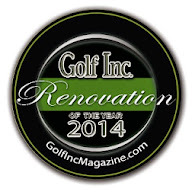 It wont be long now that you'll be able to hone your skills at one of the best short game practice facilities anywhere. Here's a quick look at how we're doing so far on this project. On Tuesday the 19th we began stripping the area of disturbance. 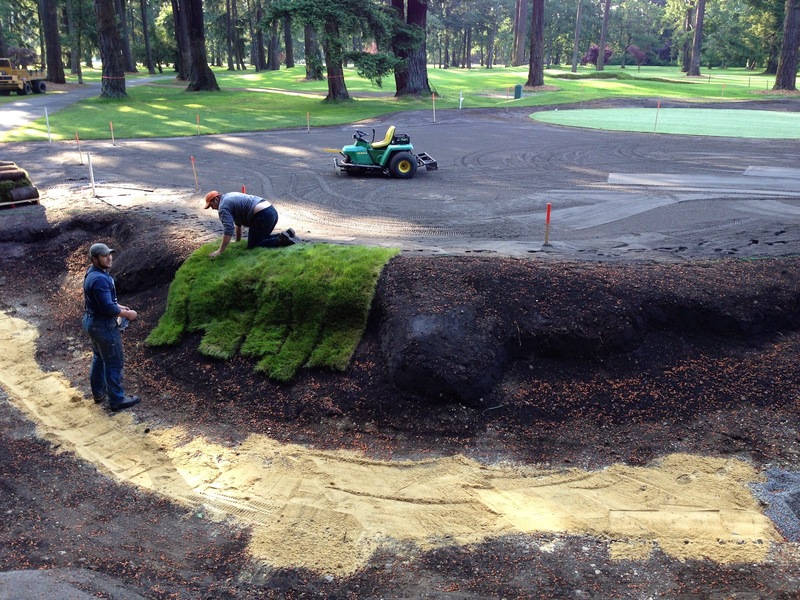 A large amount of this sod was rescued and used on the course to tie up some loose ends on some of the other projects that we recently completed. First order of business was to locate the irrigation main line so we could see if it was going to limit our objective to create a bunker similar to that which you would find on the golf course. Thankfully the pipe was nice and deep so we decided to just build right over it. 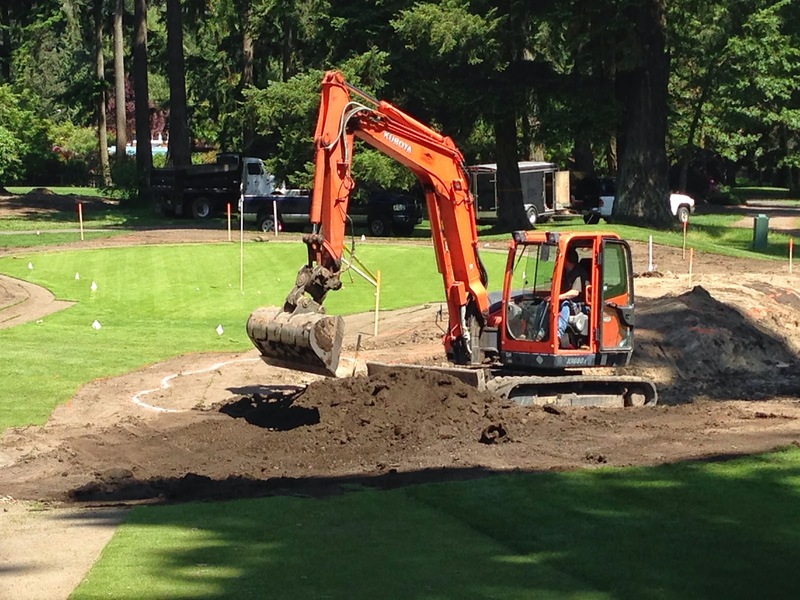 Kip got busy right away carving out the bunker east of the old 11th green. 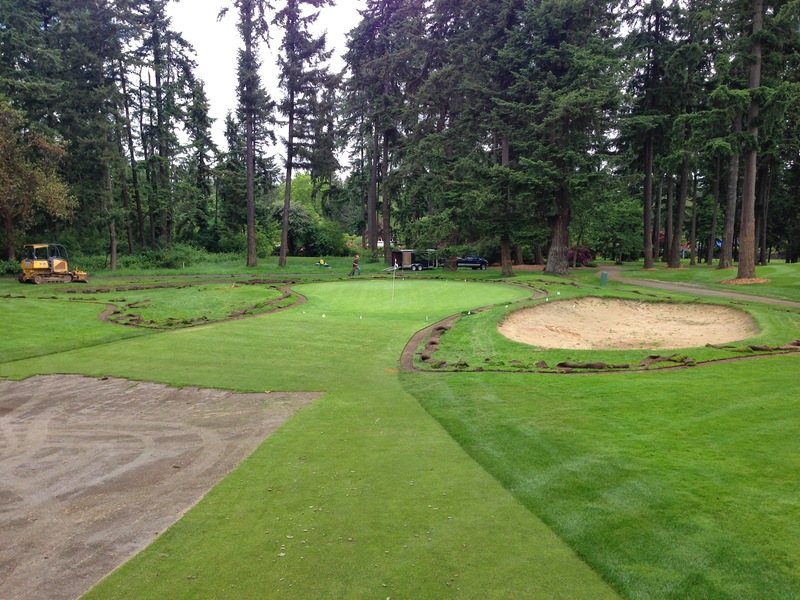 If you didn't already know, the practice hole was once the 11th hole on the original course. It was a nice little par 3 that was abandoned as part of the rerouting in 1989. It has been a practice area ever since that time but we still just call it "old 11". 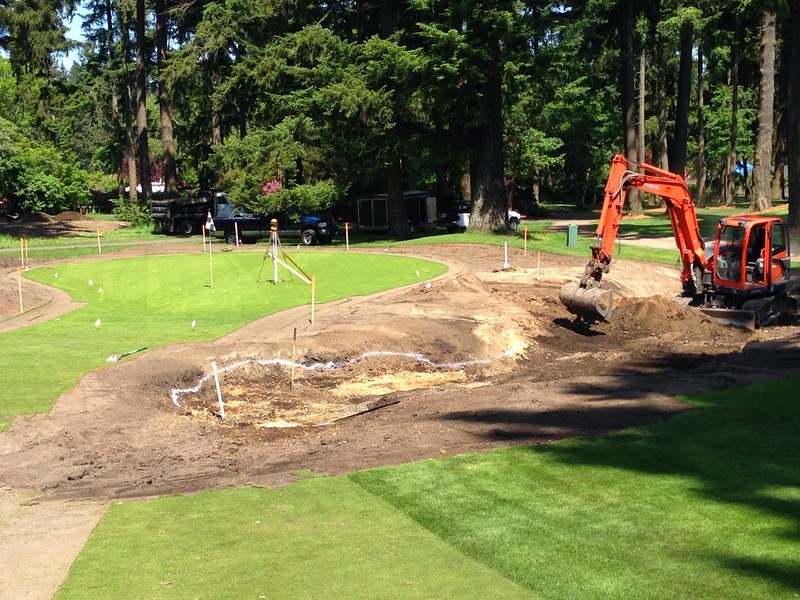 Before Memorial Day, the rough shape of the bunkers was established. 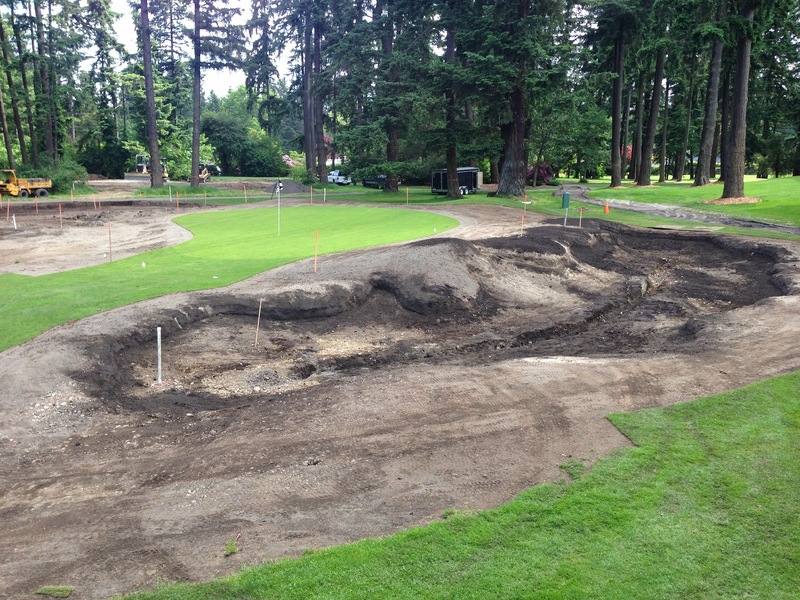 After the holiday, the bunkers were quickly made ready for sod. 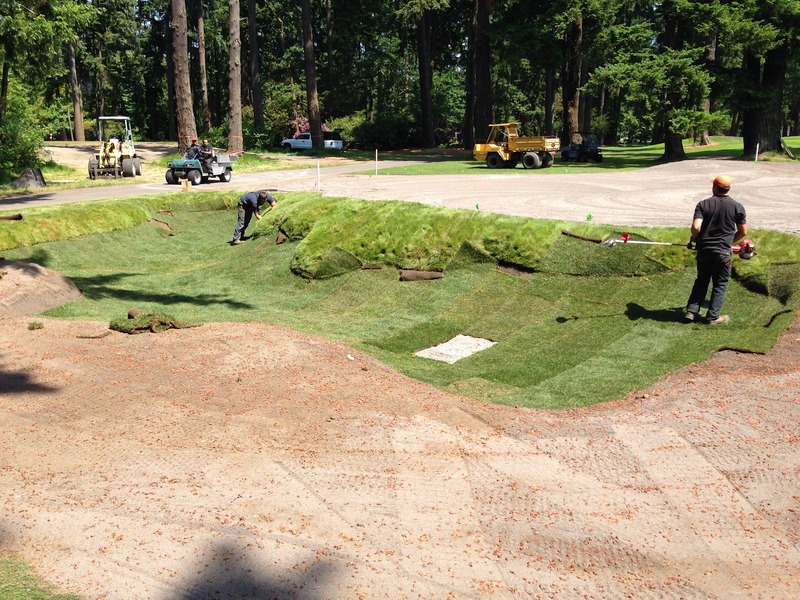 This morning, the crew started with the fescue eyebrow installation. Also take note that the green expansion has been created. Approximately 100 tons of rootzone material was used to build the green per Nick Schaan's specifications. That material was 95% sand and 5% peat. By lunchtime the fescue eyebrows were finished. This is the west bunker. After lunch the bunker liner was installed. The sod liner was 75% ryegrass and 25% kentucky bluegrass. Here's the east bunker. She's rather large. 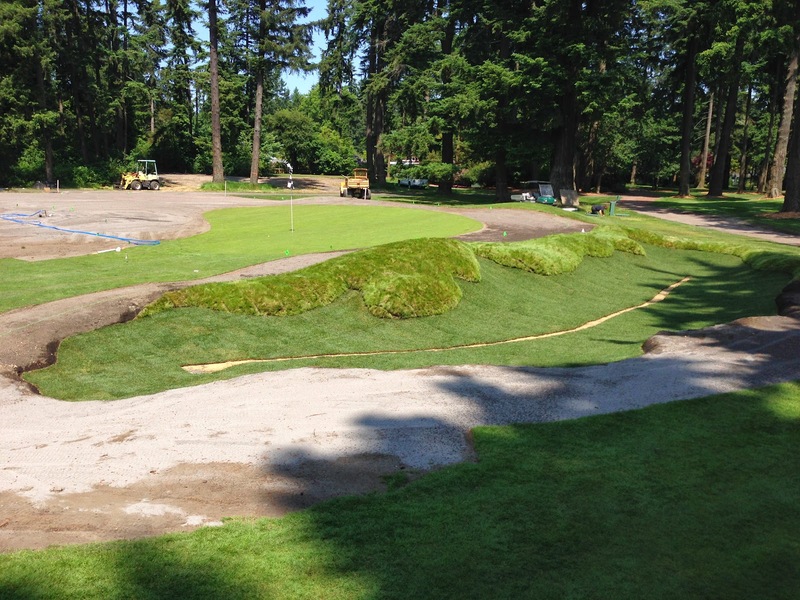 By day's end Friday this is how things looked as all the liner sod was installed, stapled down, and watered in. 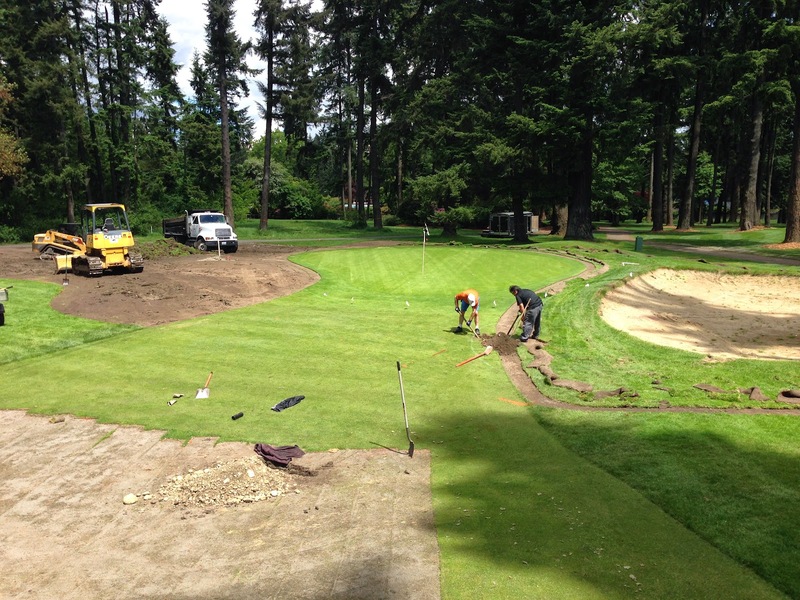 This coming Monday, Poa annua sod maintained at 1/4" will be delivered and installed on the putting surface. By the end of the day Wednesday, the rest of the rough will be installed and then we just wait till all the sod has knitted in. That should take no more than 14 days with this nice weather we're having. 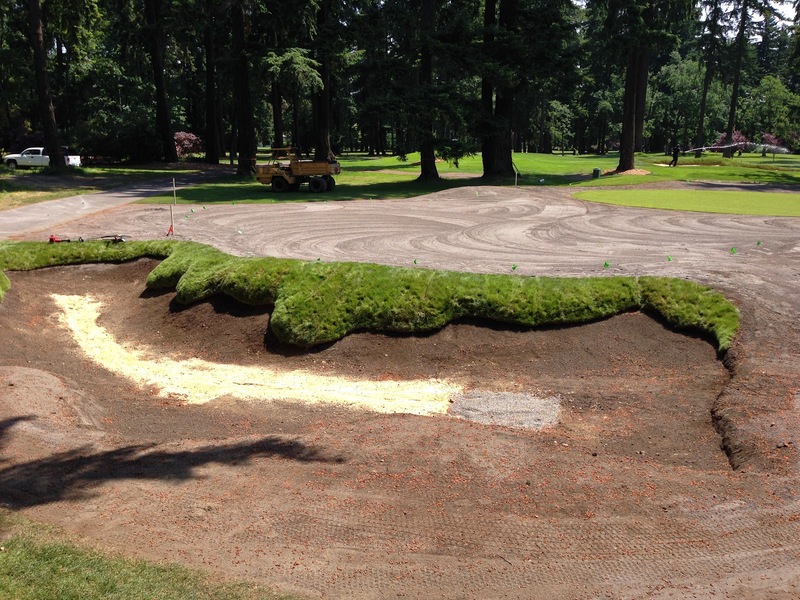 Once knitted in, we will "spray out" and kill the liner before installing the bunker sand. I hope your ready to practice your short game. Before you know it, this thing will be done and I think you're going to love it.